Through dreams, feeling sensations or simply hearing a meaningful song on the radio while having a stressful day, your deceased loved ones attempt to connect with you after their passing. There are many reasons why they return to visit, and you don’t have to be a medium or even go to one to experience the presence of a deceased loved one that you know personally. In fact, it’s incredibly common. These direct methods of communication can occur anywhere and at anytime, though they are most commonwhen you are alone and aware of your surroundings to take notice. You can receive a sign when you are fully awake, in twilight state of dreaming and waking or in dream state. With the ability to connect people and their deceased loved ones, I’ve come up with a list of the most common methods and techniques that your loved ones have used to visit you. This is the most common way to be visited by those in Spirit, both by deceased loved ones and Spirit Guides. While you may talk yourself out of a ‘Spirit visitation’ dream even if you’ve had one, these types of dreams are much different than regular dreams. In Spirit visitation dreams, a deceased loved one often enters the dream and is surrounded by some sort of light. In the dream, while they may talk to you or ask you to deliver messages, they will usually offer some sort of comfort that they are okay, everything is peaceful and that they made it to the Other Side comfortably. Many people report sensing the presence of their loved one around them after their passing. You might notice a shift when they are around – either a change in the energy or actual movement in the air. Perhaps at night, you notice pressure in the bed next to you, as if someone got into bed with you, or you might feel like someone is sitting next to you in the evenings while you read a book. This is a common type of visit. If you were very close with the person you feel is visiting and you were able to notice their presence while they were alive – you still have this ability after they have shifted from physical into Spirit form. They are the same essence they were with body, and now, without body. A hug, a brush of your hair, holding your hand, or a gentle touch on your back – these are some of the most comforting forms of connection that can happen. Feeling their touch is most common to sense in the days directly following your deceased loved one’s passing, however, some of those in Spirit do continue to visit, long after their passing, using the ability of perceived touch. This ability to touch can also manifest in feeling them not touch you, but an object near you, for instance, noticing someone sit or lay down in the bed next to you. The ability to smell the fragrance from a deceased loved one or Spirit is called clairgustance. These visits commonly reported as the fragrance of cigarette or cigar smoke, perfume, flowers, or cooking. If you smell cigar smoke, and no one smokes in your house, except your deceased grandfather – chances are, it’ him and he’s letting you know he’s around, visiting, and saying hello. This is called clairaudience. It is possible to hear the voice of your deceased loved one externally, as though they are actually speaking to you in human form, or internally, through thought or word transference. Internal clairaudience is the most common way to ‘hear a voice’, as the hearing happens inside your mind. Why? Those in Spirit no longer have a voice box – so creating an external noise is very hard. Do you talk to your husband, grandmother, or best friend on the Other Side, in your mind? Take a moment, and wait to see if you can hear a response. Usually, you can. Learn how those in Spirit hear us. We all have energy and energy runs through all things, including electrical devices. For those on the Other Side, not only is it fun to learn how to use energy to connect – many of those in Heaven learn that the energy in electrical devices is quite easy to manipulate. For this reason, it is actually quite common for those in Spirit to manipulate TV, lights and toys to get your attention. They can turn things on and off, change channels, and make things move. Songs on the radio, that are meaningful to you or your lost loved one, are a favorite way for those on the Other Side to deliver to you messages that you may need to hear – right at that exact moment, with electricity. The day after my father passed over, I received several phone calls, from unknown numbers, with nothing but static on the other line. While discussing this event with friends, they recounted similar experiences, in the days following the passing of their loved ones. Since a phone is an electrical object, manipulating the energy to make a phone call is not much different than other electrical activity. This sign could occur in the months or years following the crossing of a loved one, it seems to be most common in immediate days following the transition. Your deceased loved ones are often very eager to let you know they are part of your life and with you when you least expect it. While many people can feel their deceased loved ones watching over them, sometimes, it’s hard to be that perceptive, or to be that sure that what we felt was really what we thought it was. So, those in Spirit will provide us with signs that we cannot ignore. Once you receive this type of sign, time and time again, you will know this is a message from the Other Side – and don’t let anyone else tell you otherwise! The signs can and will come to you in a variety of ways, and the key is keep your eye open for synchronicities and anything out of the ordinary. Wondering where and what to look for? Here are a few ideas! mall Objects: Feathers, Coins, and Stones. Spirit likes to place things in our path that were significant to them (or significant to us), over and over again. My father collected stones, and will often place new stones in the path of myself, my mother, and my sister when he visits. However, others see feathers, coins, and other small objects usually in their path. Animals: Spirits use energy to be with us, and often, it is through the energy of animal world – such as a butterfly, bird, ladybug, dragonfly, or other creature – for a very short amount of time. If an animal does something usual – like land in front of or on you, stare at you through a window, or call in your path, this could be a sign. A common sign from those of the Other Side, are usually animals that are colorful (the more colorful something is – the more noticeable it is to you!). Keep an eye out for bluebirds, jays, and cardinals. Flowers: Spirits can send us flowers in unexpected ways. If you receive a flower sign, it could be in the form of an unexpected bouquet or gift, or a flower that is blooming out of season. A few months ago, I asked for a sign, specifically in the form of flowers, and three days later, I arrived at work with a bouquet on my desk. Upon asking around, no one had any idea where these flowers came from or how they got there. In another example, did your mother love bulb flowers, such as tulips, daffodils? Suddenly, you might notice one pop up in your yard. With a sign like this, it’s worth taking notice. Learn more about Flower Signs here. People: Your loved ones on the Other Side can and will use people to give you messages, and generally, the person delivering the message is not aware of it. Listen to those around you, the words they are speaking may be a direct message from the Spirit world to you! Also, those in Spirit may send meaningful people in your direction such as teachers, life partners, and new best friends. Sometimes, those in Spirits will move objects to get your attention. Does the same photograph keep falling? Is the same thing always being ‘misplaced’ or ‘lost’ while in your possession? Consider this method of communication, as it is most commonly sent to those whose attention it’s hard to reach. Also, moving objects will often times create noise, which can startle your awareness, too! Believe it or not, seeing an apparition, while you are awake, with your eyes open, is one of the least common methods on this list! Though it’s the most widely cited in popular media, due to it’s shock value, it’s quite rare. And. 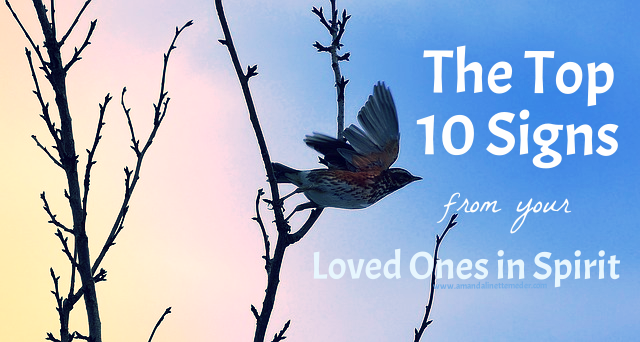 . . just because your deceased loved one isn’t appearing to you in full ‘ghost’ form, doesn’t mean they haven’t attempted contact in one of the many other methods on this list. This post was republished from amandalinettemeder.com. You can find the original post here.